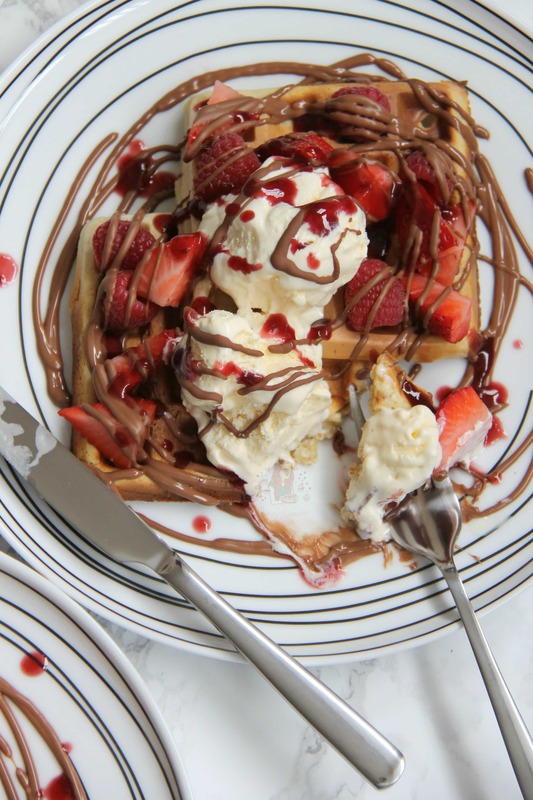 Sweet Waffles with Berries, Chocolate, Ice Cream & Coulis… Perfect Treat for Valentines! So, its nearly Valentines day again. I realise that this can be a sore subject, but honestly, its just another day! I’m not really one for all the Valentines hype as I find the day far too expensive and overpriced, so I usually just stay in with take-out and go out for dinner the day after and its half the price! 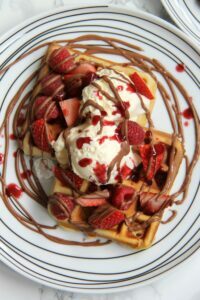 However, I am all about Valentines food. 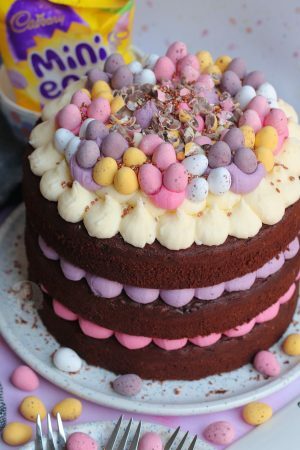 It’s indulgent, its delicious, and its the perfect excuse for a bit of baking! 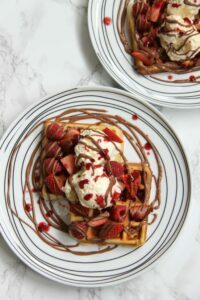 I wasn’t really sure what to do this year, but after Andrew James sent me a lovely new Waffle Maker to try out, I knew I couldn’t resist making this a Valentines recipe! Its the perfect amount for two (with a little spare if you’re not feeling as greedy as I) as it makes 4-6 waffles in the Waffle Maker I used! They sent me the Waffle Maker to use, but all views are my own! I was actually so satisfied with these pictures and how they came out. 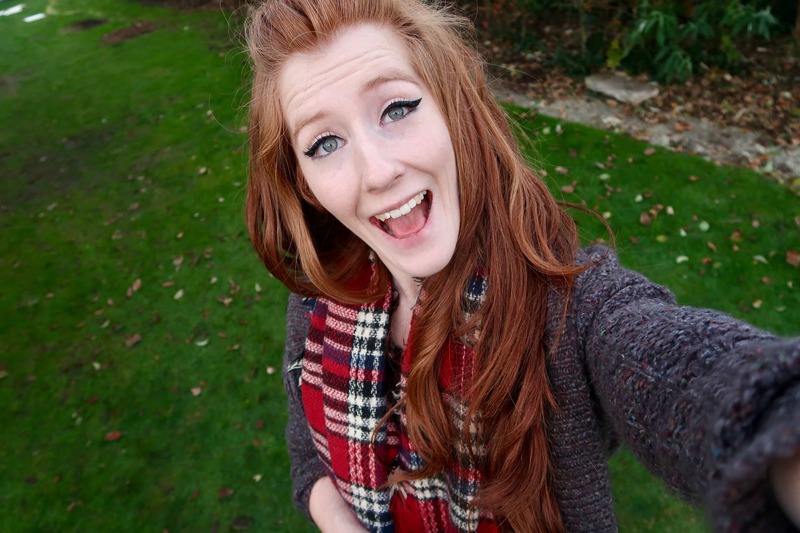 My new house isn’t the one for taking photos as it doesn’t have as big windows as my Parents house but I loved these. However, I wish there was smell-o-vision or taste-o-vision because these Photos don’t do this justice. They taste INCREDIBLE and oh my days! I only put two on each plate for the photo as it looked better and the plate was less ‘busy’. However, I did eat three waffles myself. So yay! ENJOY! 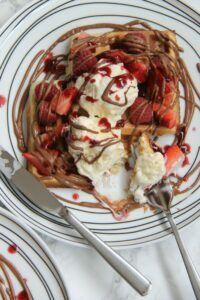 Sweet Waffles with Berries, Chocolate, Ice Cream & Coulis… Perfect Treat for Valentines, or a Delicious Breakfast! Add the Flour, Baking Powder and Sugar together in a large bowl and whisk together briefly till evenly distributed. Add in the egg, the Vanilla, and then start slowly pouring the milk in whilst whisking so there aren’t any lumps! I put my bowl on top of a tea-towel or antislip mat so that I can pour with one hand and whisk with the other! Once the mixture is smooth, turn on your Waffle Maker and wait till its at full temperature. Ladle in the batter mixture (Not so much that it overflows! You’ll learn the perfect amount through time…) and cook following your machines instructions! I like mine browner compared to pale, but after a few minutes of cooking without lifting the lid, check to see how they’re doing and go from there! 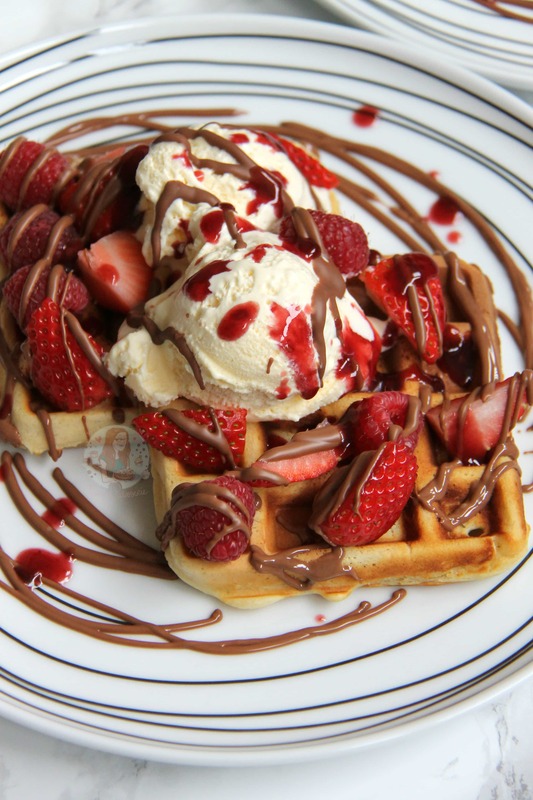 Carefully take your waffles out of the machine, and serve how you like. 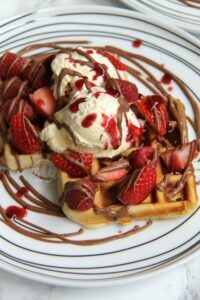 I served mine with some Melted Chocolate, Clotted Cream Ice Cream, Strawberries, Raspberries, and some Raspberry Coulis! Enjoy! 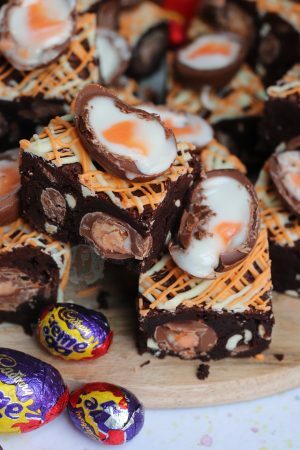 This delightful recipe was inspired by Jamie Oliver! 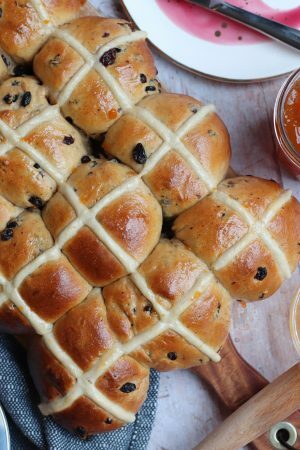 These are best served & eaten immediately – however I’m sure they would last for the day and you could reheat them later! 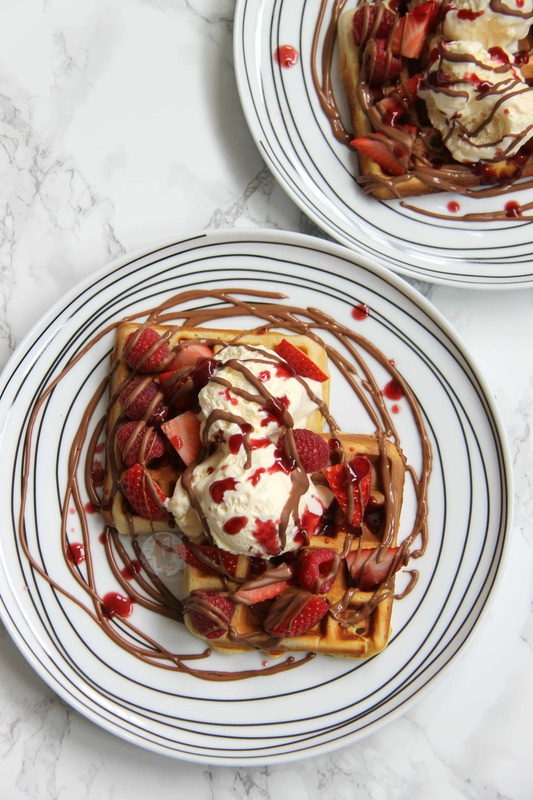 You can buy this amazing Waffle Maker from Andrew James – they have other styles available, but mine is the 4 Slice Waffle Maker with Adjustable Temperature! You can buy it through them, or on Amazon Here! 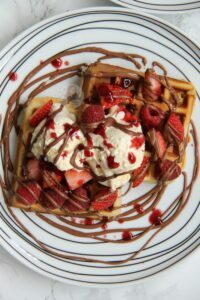 Find my other Breakfast & Valentines Recipes on my Recipes Page! Older Next post: Lemon Meringue Fudge! Newer Previous post: No-Bake Champagne Cheesecake! Well, if the Valentine’s date doesn’t work out, at least I have another option for a date that day! 😉 These look amazing! Lovely! Those look amazing!!! Keep up the good work! 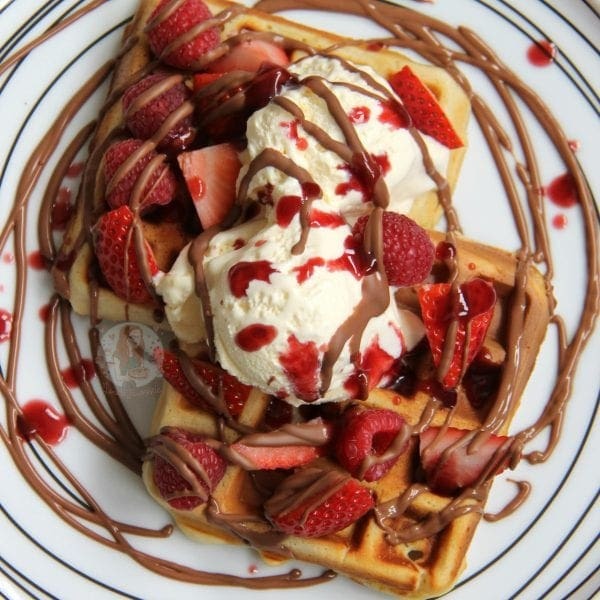 Oh my goodness, yes please, this looks so delicious! I just bought a waffle maker and haven’t really known where to start with it. 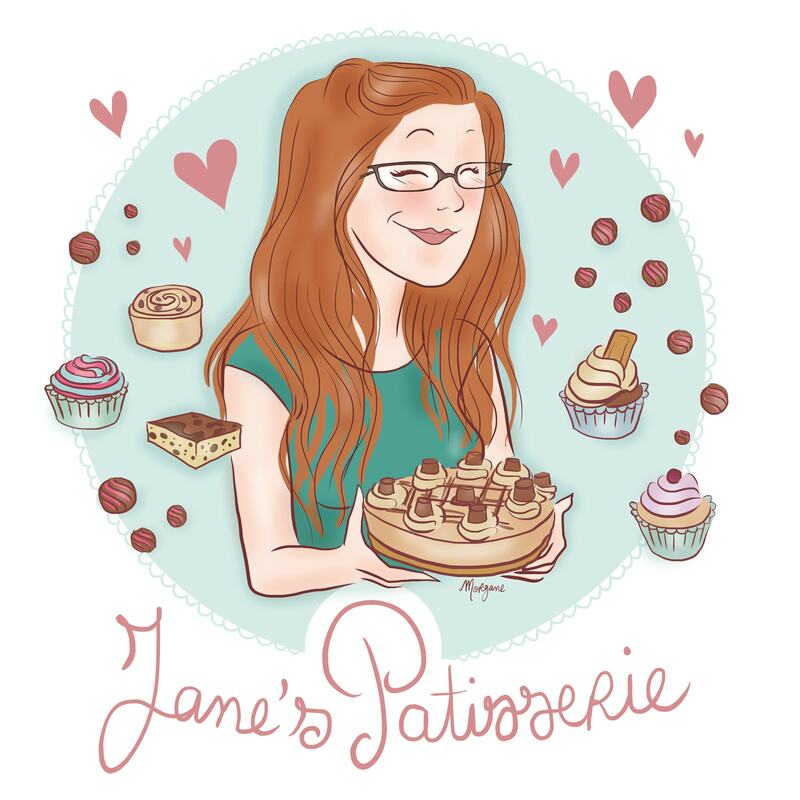 Thank you so much or sharing this Jane, I was in need of some inspiration and ideas, thank you for sharing your recipe! YUM! How heavenly do these look! 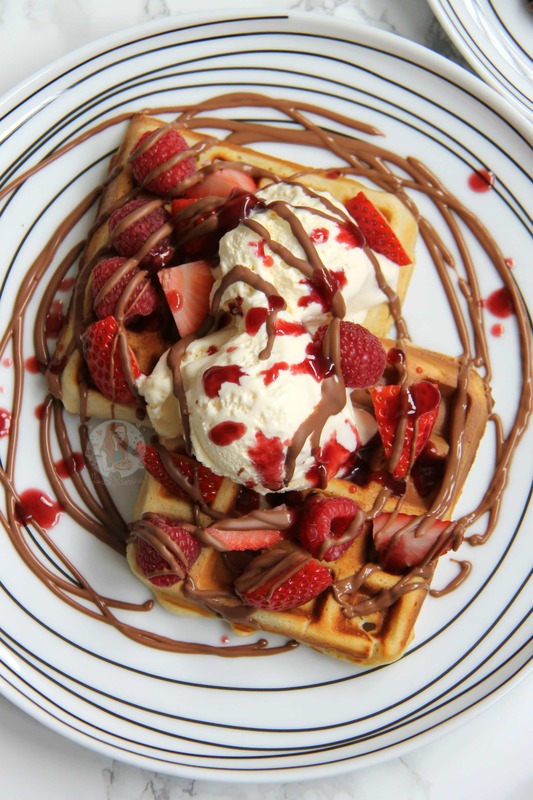 I love all that tempting fruit and all that chocolate drizzle. 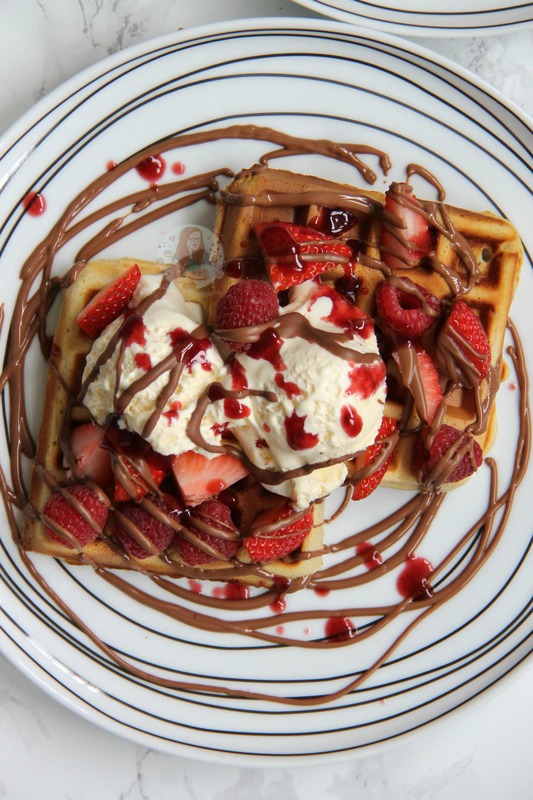 Waffle maker might be going onto my birthday wish list now….! 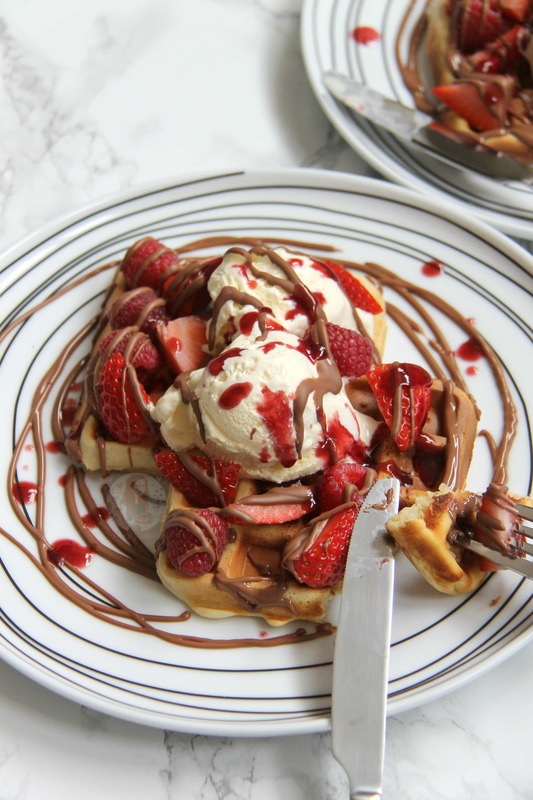 Fresh fruit, ice cream, and chocolate are definitely the best waffle toppings – I’m totally craving these right now ?